Although sick, I did manage to make a few string loops with a couple of sticks. As Shetha pointed out in her comment, working on lace might not be the best choice while full of decongestants, but socks seemed a safe bet. This is Lorna’s Laces Shepherd Sock in the Vera colorway. The stitch pattern is a standard wavy pattern with every 6th row purled. Needles are Inox Gray size US#2. I’m not normally a “pink” person, but this yarn just called to me. I like the way the browns, khaki, cream and touches of teal mix with the bright raspberry. And I really love the way it’s knitting up. It reminds me of grandma’s old afghan. I first tried to join the bandwagon and do Jaywalker socks with this yarn. But, after a few false starts, I just didn’t like the way that the Jaywalker pattern looked upside down — me being a toe-up person and all — and I tried this instead. 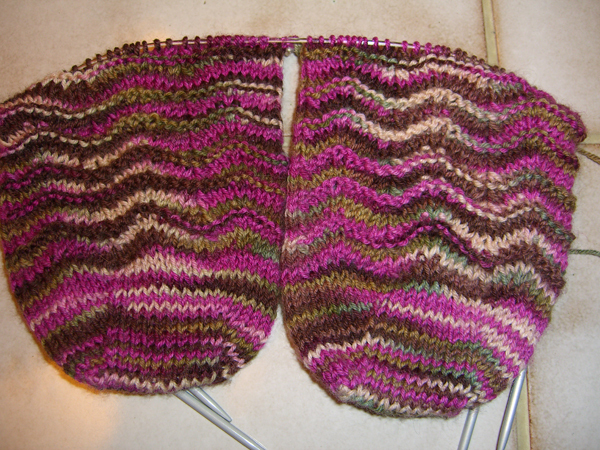 I used a fan-style toe so that the lines of increases on the toe match up with the decreases in the pattern. I did that by accident on the lace socks I made for E, and I have always wanted to try that again. And this pair, I’m making sure, fits!